Season 3 of Insane Pools on Animal Planet returns June 22 at 9pm! If you are looking for an expert in pool design, look no further than Lucas Congdon. The award-winning pool designer is back with an all new season of the most creatively unique pools. If you can dream it, Lucas can build it. The new season of INSANE POOLS: OFF THE DEEP END premieres on Friday, June 22 at 9PM ET/PT on Animal Planet, but you can catch a special episode on June 15 at 9PM ET/PT. After transforming more than 150 backyards into paradises, catch a special episode with Lucas revisiting five of his favorite builds and revealing never-before-seen, outrageous backyard creations. Then, during the new season, Lucas creates a tropical oasis complete with an island, a spectacular pool with one of the largest grotto rocks he’s ever used, and a Tiki themed cabana with local design team. The crew also heads to Sarasota to build a “plake” (pool + lake). Using more than 300 tons of rock, Lucas creates a dream backyard complete with a dock, one of his largest-ever cascading waterfalls, and an audio/ visual entertainment swim-up bar. Many professionals can build a pool, but it takes the brilliance of award-winning mastermind Lucas Congdon to create an aquatic masterpiece. 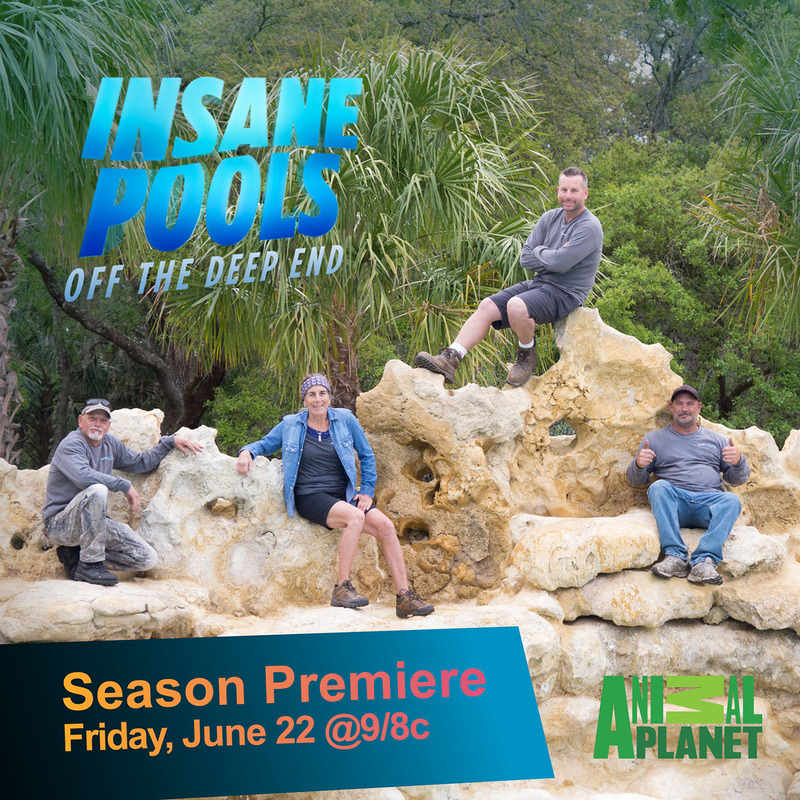 INSANE POOLS OFF THE DEEP END returns for a second season Friday, February 26, at 9 PM ET/PT and follows Lucas and his team as they take their business and customers’ backyards to another level. This season, the team dives into a slew of firsts, including some of their biggest builds, new locations and extreme, never-before-attempted creations. The Florida-based company, Lucas Lagoons, has been creating out-of-the-box designs across backyards for years. Lucas and his team create the best personal paradises in all of Florida, but this season, they take their talents to another part of the south – Huntsville, Alabama. Here, Lucas designs the largest grotto enclosed spa yet featuring the widest waterfall of his career. But, business isn’t slowing down back in Florida, where the clients’ requests are just as wild. With visions of a jungle oasis in the heart of suburbia and a lavish pool “fit for a mermaid,” Lucas has a lot on his plate to deliver a splash, catch it all on Insane Pools Off The Deep End. As amazing as the products of Lucas Lagoons are, these one-of-a-kind wonderlands come with challenges. Is the build too much for the client; can Lucas get the builds done on time and on-budget; do threats of bad weather put the progress of the project on hold? It is up to Lucas and his entire team – a combined group of crazy, yet creative geniuses – to work together and make the dreams of their clients come true. There are custom pools and gardens – and then there are Lucas Lagoons. Animal Planet’s new series, INSANE POOLS OFF THE DEEP END, follows award-winning pool designer Lucas Congdon as he turns high and dry homes into exotic waterfront properties through grand, nature-inspired designs to encourage his clients to rediscover their love of the outdoors. From a long generation of landscapers, Lucas was inspired to revolutionize an industry that was stuck in the habit of making square, boring pools. He quickly proved that his work wouldn’t fit into any box. From concept to creation, his Florida-based company, Lucas Lagoons, creates one-of-a-kind backyard oases across the country. From majestic waterfalls to natural saltwater grottos on remote islands, Lucas and his crazy team of artisans, including his mother whom everyone calls “woman,” have been building timeless creations that reinvent outdoor living for over 15 years. Lucas’s passion for these aquatic paradises is contagious, and he often finds himself convincing clients to go bigger or go home, including a couple whose original plan for a $25,000 koi pond turns into a $165,000 pool remodel! These upgrades can cause serious tension amongst the design and construction teams who are striving to execute intricate builds, and still meet client deadlines. View all the crazy action on Insane Pools Off The Deep End.